Since my article on building your own Windows Home Server / Server 2008, I’ve had a few comments on the choice of fan. That is to say, whether an aftermarket cooling solution (which can get to be very expensive) is worthwhile, and when building a budget PC – is it even necessary to splash out on a third party aftermarket cooler when the stock one that comes with the retail CPU is worthwhile. Always get an aftermarket fan. And purchase your new CPU upgrade OEM (without a supplied fan, and save yourself £5.00/$10.00). Because stock fans are severely limited. The basic fans that ship with retail packaged CPUs need to be no bigger than the smallest case, since customers purchasing a new CPU from PC World or New Egg could go home and find their case too small for the fan. Basic fans also need to be cheap so as not to impact the profit margin of the CPU vendor, and also weight is a consideration – some PC builds cannot tolerate the sheer weight of many high end fans. 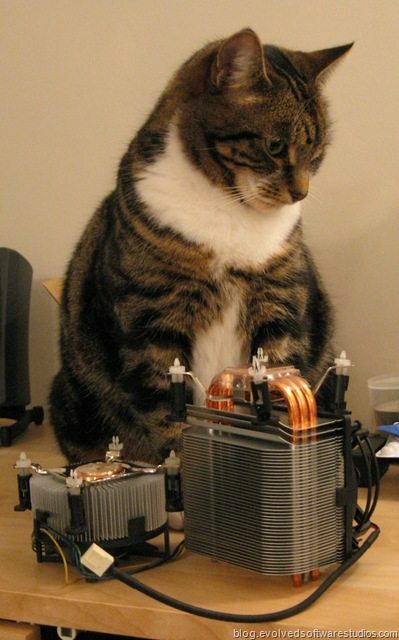 It makes sense therefore that CPU fans are supplied to the general public, as a bare minimum – sufficient, but barely. Almost any aftermarket fan (excluding for a moment the chavvy fan designs) is going to be quieter and keep your CPU cooler for longer, even under stress. A cooler CPU lives longer and errors less. For those so inclined, if you get your CPU 10-20 degrees cooler, you have more margin to overclock it. Some aftermarket air coolers work without fans at all. This is a real benefit for those who want to run a PC in the living room. If you’re asking, then you probably don’t need it. I’m personally typing this on my workstation, air cooled, nearly silent – on a 2.4Ghz Intel Core 2 Duo E6600 overclocked to 3.0Ghz. And the CPU is only 40 degrees celcius. A decent water cooling setup would be prohibitively expensive and with no-one to show it off to (who cares?) and the price of CPU’s (and the thermal energy they use) falling all the time, it’s not a sound investment. Check the reviews. There’s a world-wide custom PC community who publish user reviews on fans. Check Google before you buy. Check the dimensions of the fan, and make sure it will fit inside your case. If your motherboard is mounted vertically, don’t choose a heavy fan unless you have supports in place. Copper conducts better than steel or aluminium. Look for fans that use copper in their designs. Surface area is only good if you pass air over it – and remove hot air from your case. Make sure that you have more fans blowing in than out (try to maintain slightly higher pressure inside the case), and express hot air at the top, and put your intake fans (if any) at the front near the lower section of your case. Clean out dust! Dust covers components and keeps them hot. Make sure you get the right fitting for the fan (Socket 7, Socket AM2/939, etc). Invest in a small tube of silver thermal paste and scrub off the cheap paste that ships pre-applied to your heatsink. 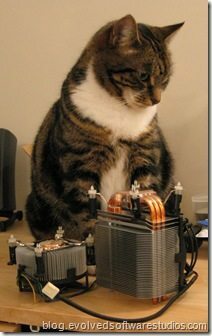 What type of cooling do you use? Comments, please!